I feature a lot of EBF fanart on the Facebook page and on this website, and have decided to start giving free Steam copies of EBF4 to anyone who gets featured. I’m also going to retroactively award some copies to people who have been featured in the past. 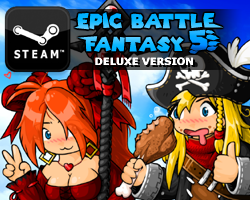 Also, for anyone who’s done fanart, you should go post it in Steam’s community section for EBF4. It’s kind of empty right now, even though a lot of fanart already exists for the game. This entry was posted in Epic Battle Fantasy 4, Game News on March 1, 2014 by Matt Roszak. Gee I noticed that fan content (mainly fanfiction) died down sometime last year on deviantart. What’s up with that? 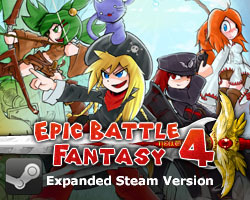 I wonder if HalcyonicFalconX got a free copy of Epic Battle Fantasy 4? I will participate. I don’t care what happens afterwards. I just want to pay a tribute to your amazing work, which I thoroughly enjoyed. Besides, it’s you who got me drawing. Stickfigures have nothing to do with EBF4. And you can’t really show that a stickfigure is Matt, Natz or some other character. Clothes are important as well, as they’re parts of characters. Sigh… will need heavy moderation depending on art quality. I won’t be entering mind you. Will this be in a limited time? I’m quite interested. My only problem is that I’m not a digital artist like the others. I do however posted fanart on deviantArt… but, it seems it’s not good enough.